I know. I know. I feel the same way. Okay okay. Let me walk you through why Ari Francis Schultz’s visit here is so important to you, this institution, and, yes, the future of medicine. Ari Francis Schultz is a man of constitution, intellect, charm, and looks far beyond what most of us can dream of for ourselves or for our children. Ari Francis Schultz’s contributions to human kind, and commitment to the common good, cannot be overstated, even by someone as portentous as myself. From an early age, Ari Francis Schultz was blazing new medical paths. 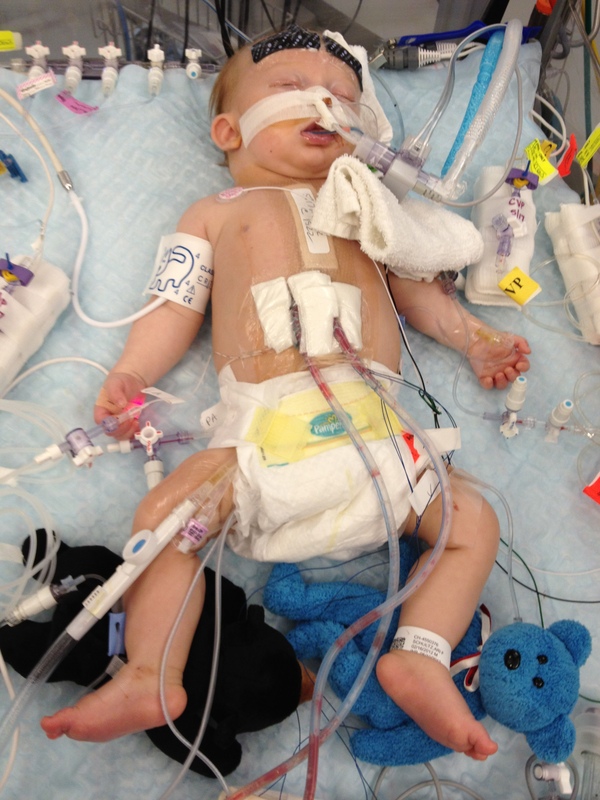 He was the first person ever to have successful heart surgery twice before birth. Within hours of joining us here on our little planet, he had his first heart procedure, followed shortly thereafter by his second. These procedures temporarily improved his aortic stenosis, though they did nothing for the extensive scar tissue on the lining of his left ventricle or his persisting pulmonary hypertension. Underwent a catheter procedure that revealed a “fragile” heart and persisting pulmonary hypertension. He thus needed an immediate, “definitive” solution to these life-threatening problems. Endured a Ross Procedure, whereby he was placed on heart-lung bypass, his aortic valve was removed and replaced with his pulmonary valve. A homograft was inserted where his pulmonary valve used to be. And his EFE (scar tissue) was carefully resected throughout his left ventricle. Spent the last 6 days in the Cardiac Intensive Care Unit recovering. For the first several days, he had more equipment and wires on him than the Six Million Dollar Man. Asked, just a few days ago – via mental telepathy since he was on more narcotics than the cast of Saturday Night Live in 1977 – to have his breathing tube removed to prepare for this speech to you people. He loves you people. All this, and he somehow found time last week to invent the Betamax, the Radio Pram, and Plastic sneeuwstormbeschermer. Back to this week, when the breathing tube was removed, his airway was inflamed. Thus he needed extensive breathing support via BPAP to get enough oxygen to his body, and nitric oxide and to lower his pulmonary arterial pressure below systemic levels. Regarding his pulmonary hypertension, before the surgery he did not respond to any treatment at all. Now it is beginning to seem that he is. The long-term consensus from his medial team is that, over time, we will be able to get this life-threatening hypertension under control. Though, how long it will take is unknown – we’re told months – and it is in no way a certainty. As of a few minutes ago, he was still on moderate BPAP breathing support with Nitric Oxide, was heavily sedated with pain medication, and was sound asleep. If he didn’t have this speech to give, he would likely rest comfortably in CICU for another week or more, and spend at least several more weeks – but who knows how long really – in the hospital until returning to his normal insane schedule. Again, by telepathy, he told his doctors he needed to be removed from all supports, to be buffed up by any means necessary, and to be escorted to this very stage to address you, the future leading doctors of the world, with perhaps the most important advice you have ever received, or will ever receive until your dying day. And so I bring you a man who proves that a single life with purpose can change the world. Ari….Can not wait to meet you……Wow!!!!!!! Lots of LOVE!!! Ari might be the toughest guy I know!! First off, he would start of his speech by saying, “Let me thank the two most important and influential people in the world, for which none of this would be possible. My incredible strong and loving parents….Mommy and Daddy! They are truly the strongest people I know.” Now,onto Ari…you are destined for greatness and your purpose here on earth is something I want to live long enough to see, Keep on Truckin’ young man…love, Cousin Wendy!! An excellent and educational speech. Congrats, Ari. I was actually expecting to see Ari on the commencement stage at Harvard! I love Mike’s updates. Is Dad on narcotics, too, lol? So entertaining. WTG, Ari, you are our hero! Way to leave us hangin….. Very glad to read that Ari is now responding to treatment for the PH. Nitric is good stuff for that. I’ll be thinking of you and looking forward to reading the commencement address.